Roman Polanski’s film of Macbeth is one of my favourite Shakespeare adaptations, right up there with Branagh’s four-hour Hamlet, Olivier’s Henry V and Kurosawa’s Throne of Blood (which is the Japanese Macbeth – but it’s very difficult to compare Polanski’s version with Kurosawa’s, given that one uses Shakespeare’s actual words and the other doesn’t. I think the difference is crucial to the effect of watching the films). Polanski treats almost the entire soliloquy as a private contemplation, which is appropriate; these are deeply reflective words. 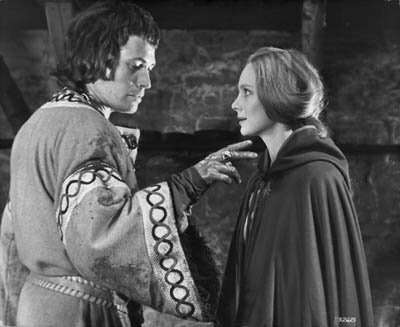 Macbeth’s lips move only once: when, clasping the seal that has been presented to him, he says the line “I am Thane of Cawdor” – almost as if to convince himself that all this is really happening, that his greatest hopes (and fears) are coming to pass. 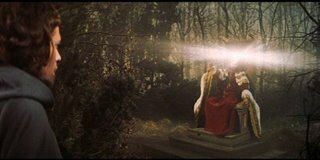 This is repeated in a later scene when a magical dagger seems to appear before his eyes – he says “Come, let me clutch thee” out loud but the rest of his lines are thought, not said. 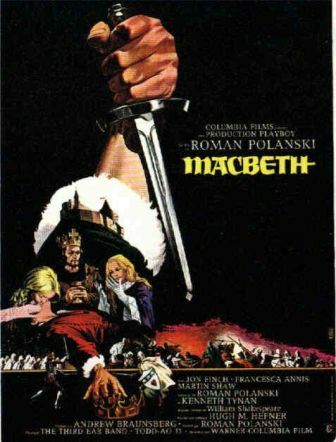 Apart from achieving a certain type of cinematic realism (and remember, there are many varieties), Polanski’s approach also makes for a Macbeth that is smaller than life, less grand than what we expect from a standard production of a Shakespeare play. An element of hopelessness, of surrender to life’s mishaps, runs through this director’s work and this film is no exception. Neither Macbeth nor his wife (or any of the other characters for that matter) are prime movers – nearly everyone is passive, allowing things to happen to them and reacting lackadaisically. 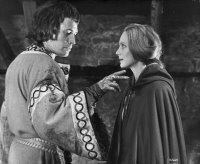 The film's Macbeth (superbly played by Jon Finch) comes across as a confused little man who does things almost randomly, without understanding the implications – not one of literature’s great tragic figures whose every deed (good and bad) stems from his essential nature. Francesca Annis’s Lady Macbeth is fragile in appearance, which makes her initial exhorting of her husband to evil more effective – but even she doesn’t hold the stage for any length of time. The hand-washing scene isn’t shot to evoke a sense of High Drama (as it superbly was in the Kurosawa version), it’s understated and somewhat pathetic – this Lady Macbeth feels like a victim of circumstance, a little woman who allowed momentary greed to enmesh her in things that were way over her head. One almost feels that her comeuppance is disproportionate to her crime. The nihilism on view here is more Polanski than Shakespeare, but there are many things to enjoy even for purists. The splendid cinematography for one, with the deliberately gloomy outdoor sequences creating an oppressive effect that’s so suited to this story. 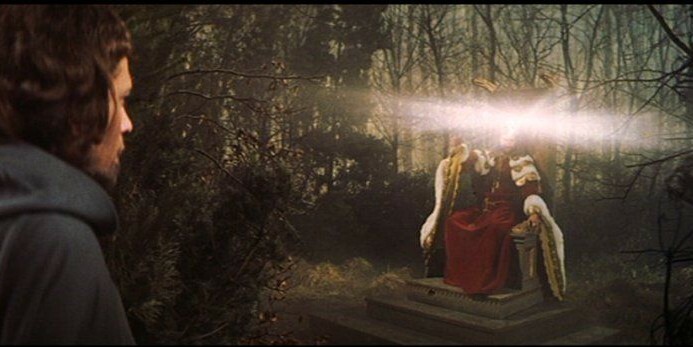 And yet, despite the understatement, Polanski does turn into a stylist when he has to, and pulls it off brilliantly (note the striking fantasy scene with mirrors, when Macbeth has a vision of Banquo’s son becoming king). Then there’s the way he sets images to Shakespeare’s words to fit his own worldview. When Macbeth says (or, in this case, thinks) the lines “Stars, hide your fires/Let not light see my black and deep desires”, he is shown looking at the dead body of the former thane of Cawdor, a traitor now hanging outside the castle walls. The image becomes a form of prefiguring: Macbeth’s deep and black desires will bring him to a similar end. But it also points to the cyclical nature of evil, allowing us to reflect that the previous thane must have had overvaulting ambitions of his own. The very last scene of the film, which I won’t reveal here, takes this theme further and is markedly different in tone from the play’s ending. There are little vignettes that suggest a close reading of the specifics of Shakespeare’s text (quite remarkable considering that English wasn’t Polanski’s first language). When the ghost of Banquo first appears and Macbeth cries out to his men in guilty terror, “Which of you has done this? Thou canst not say I did it”, the ghost nods his bloody head with a look of sorrowful reproach, as if to say “Yes, you did this.” (It adds such resonance to Macbeth’s next line: “Never shake thy gory locks at me!”) Also watch the faraway expression on Finch’s face when Macbeth hears the witches’ prophecies for the first time – he’s so mesmerised that he looks around distractedly when Banquo addresses him from behind, almost as if he were expecting another prophecy to come at him from the sky. There’s an interesting article here about the back-story of Polanski’s Macbeth: including the slaughter of his heavily pregnant wife Sharon Tate by the Charles Manson gang in 1969 (as Roger Ebert points out, the viewer’s knowledge of this incident brings such frisson to Macbeth’s climactic revelation: “Macduff was from his mother’s womb untimely ripped”), the director’s subsequent bouts with depression and his whimsical behaviour during the shooting of this film. Some of this may help explain why Polanski’s Macbeth – his entire filmography, for that matter – is as bleak as it is. Other Polanski films I love: Knife in the Water, Repulsion, The Fearless Vampire Killers, Chinatown and the underrated The Tenant. Old post about Shakespeare on film here. 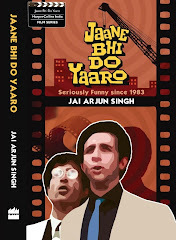 this is an excellent post Jai. I haven't yet seen it, will check it out soon. I love his "apartment movies" a lot, Tenant, Repulsion and Rosemary's Baby. Wouldn't a deliberate theatricality be better? If you try to adapt the play into a "realistic" cinema, I feel you are rather adapting Lamb's tales from Shakespeare rather than Shakespeare himself. By any standard definitions of literary realism, Shakespeare's plays are not realistic plays at all! I am not arguing for a filmed theatre here, one take, static, objective camera kind of thing but rather find a cinematic stylization which approximates the essential nature of the play. I also had the same problem with the recent hindi film Omkara. Except for the last act, there wasn't a hint of stylization in the whole movie. A documentary realism defeats the whole purpose of adapting Shakepeare and turns Othello into a banal story passion, jealousy and thwarted ambition! I also have this problem with non-english adaptations. You just never get to hear all those phrases and words, which I think are the soul of the plays! I wasn't expressing a preference for realism over deliberate theatricality. Both forms are equally valid in my view, the only thing that matters is how well the thing is done. You have a point about stylization being truer to the Shakespeare spirit, but I think many of the plays are intrinsically powerful enough to survive a different, more naturalised approach. The more relevant question here is: since the dialogue was written for maximum theatrical impact, how easy is it to retain the original language and still produce a subtle/"realistic" film? That's what the voiceover technique helps Polanski achieve to an extent. It would have been a very different film if every single line were to be spoken out loud. On that note, have you seen Kurosawa's The Bad Sleep Well? A modified version of Hamlet set in modern-day (1960s) corporate Japan, and quite understated (at least when compared to Throne of Blood and Ran!). Yes in fact, voice-over itself is a highly stylized device! It is I think a good example of how style gets translated from one medium to another. I haven't seen that Kurosawa's film yet. In fact, I haven seen very few Shakespeare movies. Orson Welles's Chimes at Midnight is also on many people's favourites list. It is another film that I want to see. Chimes is interesting, but Welles' narcissism sours the experience. Has there ever been a more narcissistic actor in the history of cinema? Brilliant post and I totally agree. I have always loved the closing scenes which suggest the cycle will continue. So much bleaker and more in keeping with the nihilistic tone of the piece than the neatly tied-up text. Have you ever seen the recent Ian McKellan, Kristin Scott-Thomas Richard III? I thought it contained some fun ideas but was a bit too over-worked. Also, I recently saw a couple of modern day Shakespeare adaptations, including Omkara & West Side Story, & both left me cold. For one, the beauty of the original dialogue is missing, as Alok pointed out, & also, Shakespearean plot mechanisms don't work very well when updated to modern times. But hey, the stories are always to die for, & if like Baz Luhrmann's Romeo + Juliet the director can capture the spirit & vitality of the original, it can be a very pleasurable experience. Tipu, yes, I have seen that version of Macbeth - heavily atmospheric, minimal props - and I loved it. There are some roles in which the narcissism doesn't annoy as much - "Touch of Evil" is another example. But in "The Trial" or in the pathetically autobiographical Falstaff from Chimes, it becomes well nigh unbearable. this is an excellent review. i like knife in the water, chinatown and rosemary's baby too. why are u linking to wikipedia instead of imdb? Nandhu: oh, I link to a Wikipedia entry if I think it's comprehensive or has something interesting to say. And for film titles and people names, the Wiki pages have the link to the IMDB entry anyway.